Our stretching kits were the first of their kind. The idea came to life during my own personal stretching journey. We want to give our consumers a safe, heathy, easy and affordable method to reaching their desired size. Let’s be real, it’s not always the easiest and that’s why we are here. We are proud of our homemade kits and are confident they will get you to your desired size in the best possible way. Click below to check out our ear stretching guide and as always, hit us with any questions. Here at King’s Body Jewelry, we have a passion for local, transparent and honest business. We process, package and place every order with our own hands. At King’s Body Jewelry we strive to have a large selection of high quality jewelry at affordable prices. We work to provide our people with strong customer service that reflects the energy of a small, local business. 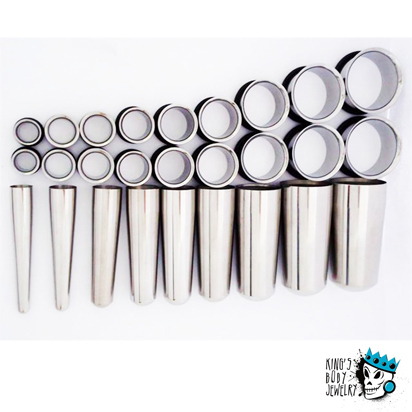 We carry almost every size and style of jewelry whether you need 18mm plugs or 3-inch tunnels. We carry it all: 316L stainless steel, buffalo horn and bone, natural stones, pyrex glass, acrylic, wood and more. We are here to help you express yourself and support each and everyone of our loyal customers.